By Manuel Perez: Mark my words, WBA light welterweight champion Amir Khan (21-1, 15 KO’s) will not only beat Manny Pacquiao when they eventually meet up, but he will knock him out in the process. Yesterday, I showed the boxing world part of the sparring sessions – – between Khan and Pacquiao, the ones that it’s been rumored where dominated by Khan. Even Freddie Roach, Pacquiao’s trainer, came away enthusiastic about Khan after seeing how he handled Pacquiao during the sparring sessions. Pacquiao will be busy for awhile training for what looks to be an almost certain loss against Miguel Cotto on November 14th, but after that there will likely be a huge hole in Pacquiao’s schedule for him to make a fight with the young Khan. Floyd Mayweather Jr. or Juan Manuel Marquez were supposed to be the fighters that Pacquiao was going to face next after the Cotto fight, but a fight against Mayweather/Marquez hinges on Pacquiao beating Cotto. Without a win over Cotto, Pacquiao is useless for Mayweather/Marquez and tainted. You can forget about that fight happening, as Mayweather and/or Juan Manuel Marquez would have a better option by fighting Cotto. This will leave Pacquiao out in the cold looking for a big named opponent to try and undo the damage from his defeat at the hands of Cotto. This is where Khan would step in as the perfect opponent for Pacquiao to fight. Frank Warren, Khan’s promoter, might go for a fight against Pacquiao if the money figures are right. This is a fight that I see as Pacquiao’s equivalent of Waterloo. Khan will circle him and rush him with combinations like the ones that he was raining on Pacquiao in the sparring video between the two fighters. Some boxing fans of Pacquiao were quick to come up with some farfetched excuses for Pacquiao looking so bad against Khan, things along the lines of “Pacquiao never spars hard” or “Pacquiao was told to let Khan beat him up.” Ah, no, that’s not how it was. From what I can see, Khan was simply the faster, the stronger and the bigger fighter. He was superior in every way to Pacquiao and even when the Filipino was landing his own shots, they seemed much weaker and inconsequential compared to the harder shots that Khan was throwing at him. 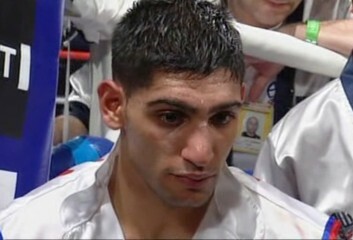 There’s no shame in that, and don’t see it as a knock on Pacquiao that he didn’t look as good as Khan. I mean, Khan is the bigger fighter with better hand speed, an Olympic Silver Medalist. Does Pacquiao have an Olympic Medal? Ah, no. Khan was better because he was supposed to be better. He has the amateur credentials, whereas Pacquiao doesn’t. I think when the time comes for this fight to be made, hopefully sooner rather than later, Pacquiao will be on the edge of oblivion. He will already have been defeated by Cotto, and a knockout loss by Khan will be the final straw that sends Pacquiao into retirement where he can try to become president of the Philippines. Khan will win, like I said, and win by knockout.